Just back from KLCC and I proud to say I'm very Happy ^^ and owner of new phone today. Nah! just collected my prize from Gomobile booth (which also the organizer of the event) since I was chosen as August winner blogspot contest. Losta folk, sales man/girl eyeing your attention to sell their phone or interactive service to pimp up your existing phone, new shinny phone (hint : Iphone 3G) yet expensive on display, new tech *suddenly I felt very outdated* . Anyway. 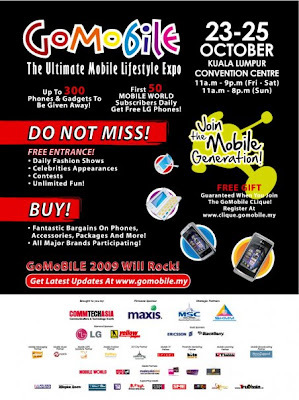 Feel free to visit the GOmoblie 2009 exhibition at KLCC convention center which end tommorow.